HomeB1A4[COVER] SHINee, Teen Top, B1A4, Jay Park, and 7.9.4.2 Heat Up The Singapore Indoor Stadium at Boyz Nite Out K-pop Festival! It was indeed a ‘Boyz Nite Out‘ filled with memorable experience for fans of Teen Top, B1A4, 7.9.4.2, Jay Park and SHINee on the evening of 15th June. The 135-minute showcase saw the 5 different groups of K-pop artistes belting out their hit songs to a 3,000-strong audience that are predominantly teens and young adults. 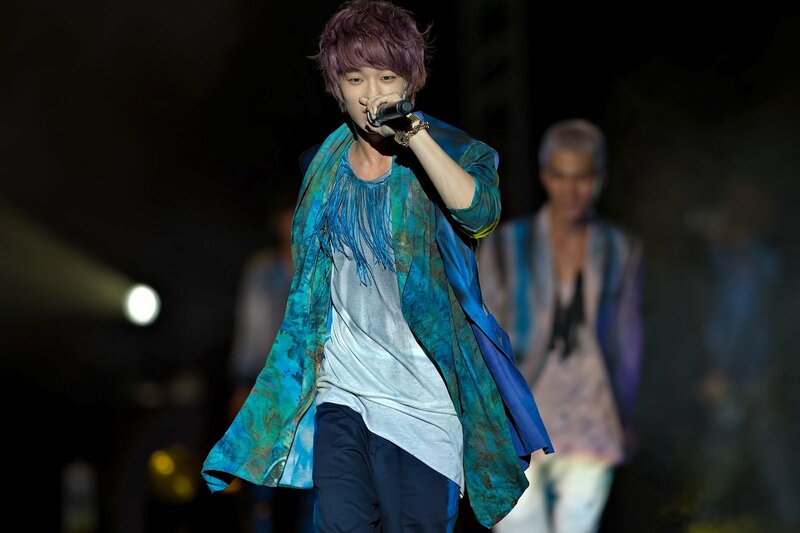 Kicking off the concert was 6-member boy band Teen Top which consists of C.A.P, Chunji, Niel, L.Joe, Ricky, and Changjo. The group opened with an enthusiastic ‘To You‘, a title track from their latest single album produced and written by the Brave Brothers and YG Entertainment trainee, Kang Park respectively. The crowd cheered on as they continued with performances of ‘Girlfriend‘, ‘No More Perfume On You‘, and ‘Crazy‘, a delight dance number. 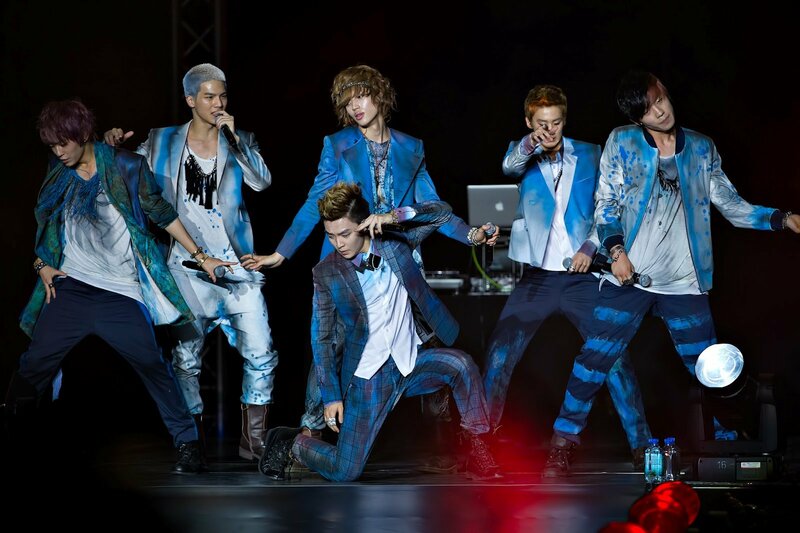 Teen Top also performed ‘Brushing‘ as they strove to enliven up the mood with the infectious beat of their music. 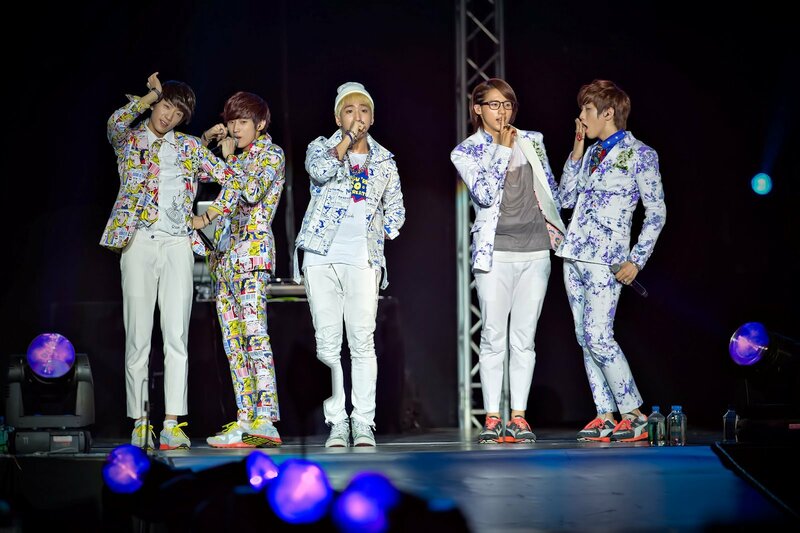 The second group to perform that evening was B1A4, which comprises of members Jinyoung, CNU, Gongchan, Baro, and Sandeul. It was B1A4’s second visit to Singapore, and they charmed the audience once again with crowd favorites such as ‘Beautiful Target‘, ‘Baby I’m Sorry‘, ‘Only Learned The Bad Things‘, ‘Baby Good Night‘, and ‘OK‘. The members turned on their boyish charm to full power with frequent banter with BANAs (a name for their fans) and cracked jokes that were enjoyed by an appreciative audience. Following, the third act of the evening was a relatively new group, 7.9.4.2, that deserves more attention for their strong and melodious vocals. 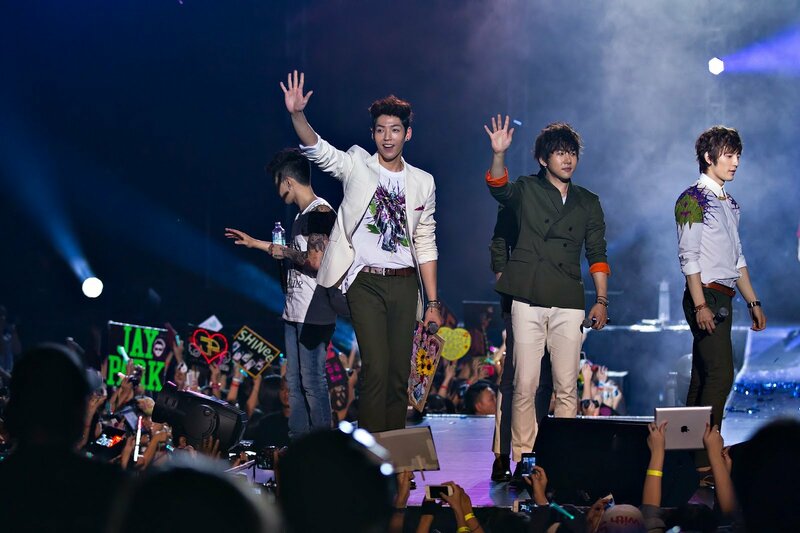 Comprising of members Haenghoon, Jo Hoon, Jonghyun, and Eungjoo, the vocal powerhouse performed their title track, ‘I’ll Be Famous‘, followed by ‘More Than I See You‘, a soundtrack that they have participated in the series of Korean-Indonesian drama, “Saranghae, I Love You”. The members have been cast in this drama before their debut this year, which is set to begin airing in July. 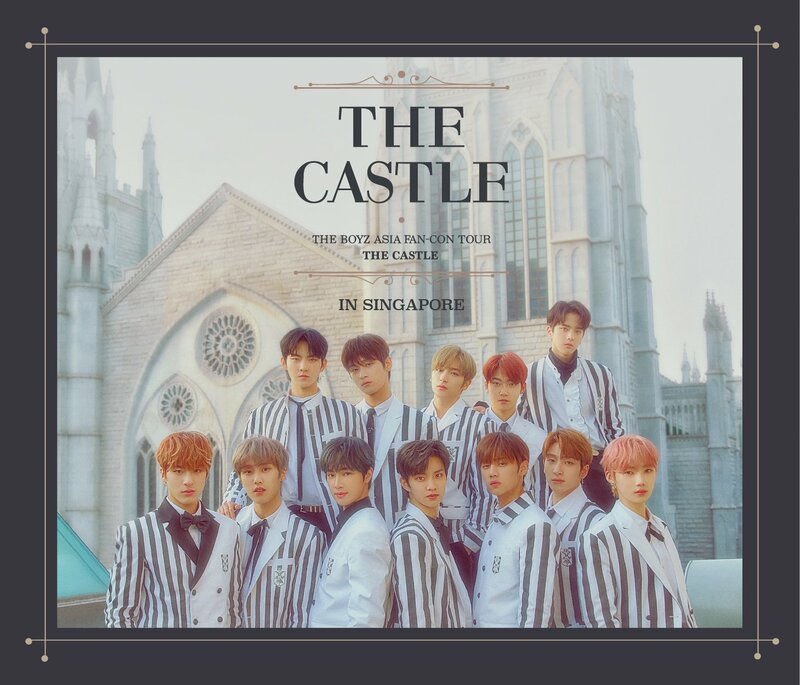 The group also specially prepared a K-pop medley for the fans, of which included ‘Paradise‘, the theme song of popular Korean drama “Boys Over Flowers”, which certainly brought back nostalgic moments to many as they sang along to the up-beat song. With much confidence and ease on stage, 7.9.4.2 is comparable with the amateur performers in K-pop, making it one of the groups to look out for in 2012. 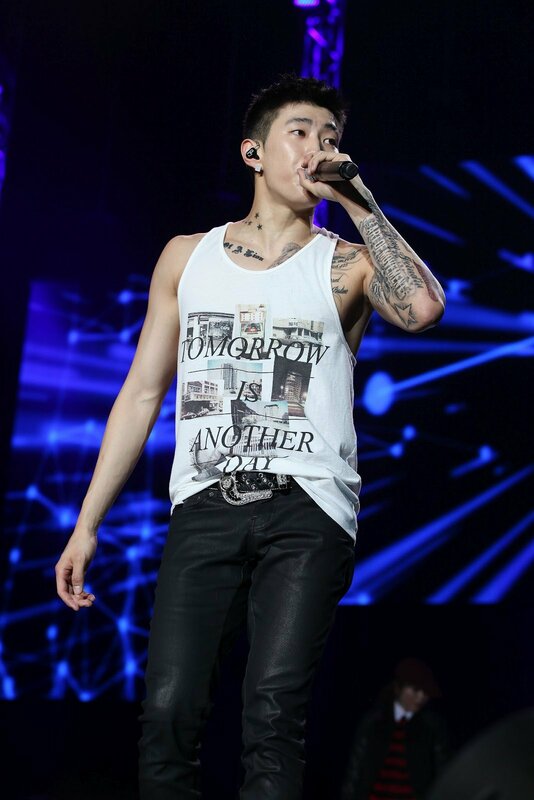 The atmosphere was further livened and pumped up by Jay Park, the multi-talented recording artist, dancer, rapper, B-Boy & songwriter who has a magnetic stage presence that one simply cannot take their eyes off him. Beyond the chiselled good looks and famous ‘washboard abs’ bellies a humble yet determined spirit who seeks perfection in his craft. As soon as Jay Park hit the stage with songs like ‘Know Your Name‘, ‘I Got Your Back‘, ‘Star‘, and the hugely popular ‘Nothing on You‘, the passion of the audience was immediately fired up by him. Loud cheers greeted Jay as he freely engaged in cheeky onstage banter in fluent English with Jaywalkers (a name for his fans) in between the songs and performances. Jay worked the female fans into a frenzy when he confessed about feeling lonely at times due to his frequent travels and longed to have a girlfriend as he sang a song of the same name. There were interactions aplenty, as Jay charmed his way into the hearts of many with his rhythmic pelvic thrusts and strong vocals when performing ‘Turn Off Your Phone‘, ‘Do What We Do‘, and ‘Body2Body‘. There was even a heart-stopping/fluttering moment when he pulled off a stunning B-Boy pose at the center extended stage and later generously revealed his well-toned body after peeling a white tee-shirt off his back. 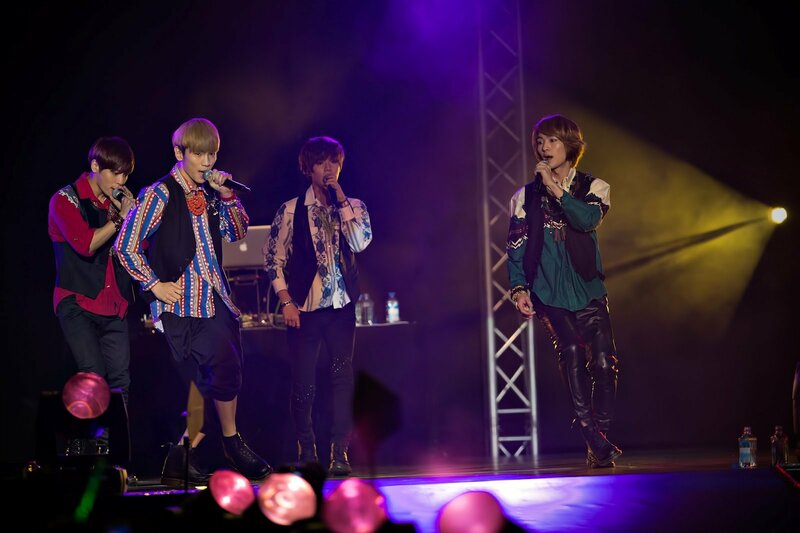 The finale of the night went to SHINee, a group that was highly anticipated by many during the concert. 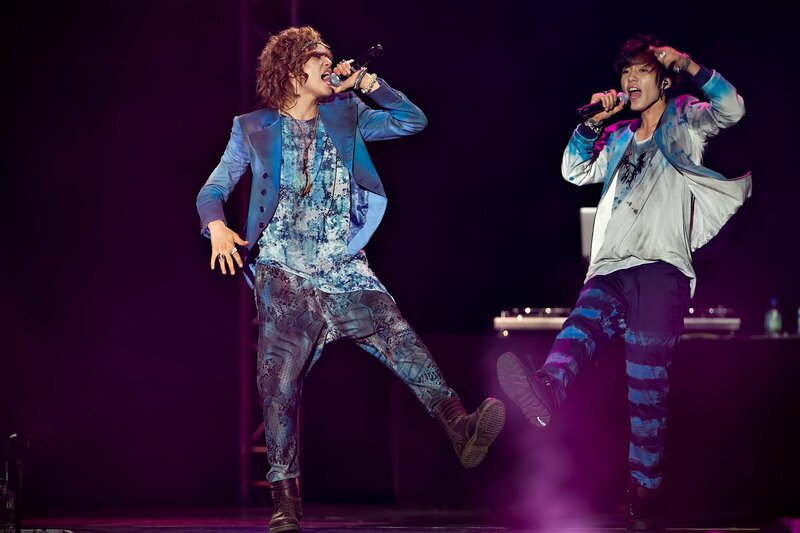 SHINee’s avant-garde/innovative fashion style is as fascinating as their music. The stadium immediately transformed into a sea of pearlescent blue as the quintet arrived on stage. Although member Min Ho was unable to turn up for the concert due to his tight filming schedule, the rest of the members (Onew, Jong Hyun, Key, and Taemin) made commendable effort to sing his parts to fill the gap. SHINee opened their segment with ‘Replay‘, followed by smash hits ‘Ring Ding Dong‘, ‘Lucifer‘, ‘Stranger‘, and ‘Sherlock‘, which catapulted fans from their seats as they waved their lightsticks in unison. Though the choreography of ‘Sherlock’ was challenging, the members executed the moves smoothly and ended the last performance of the night on a high note. 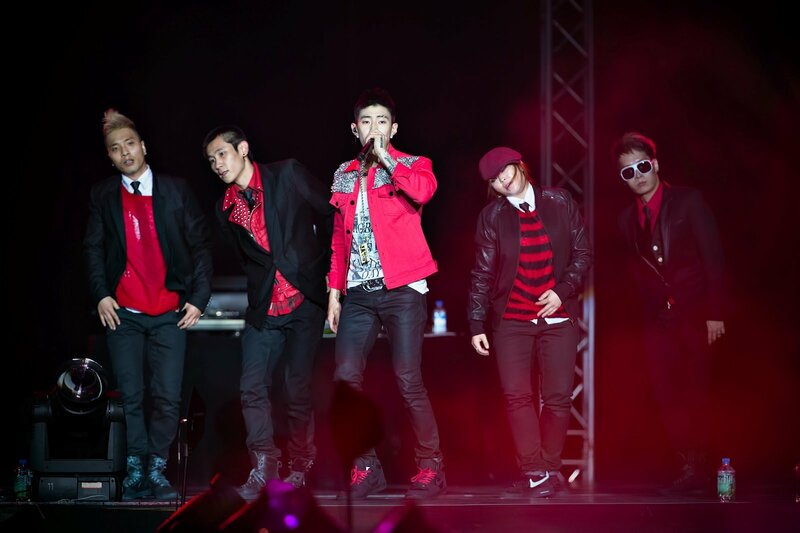 Boyz Nite Out concert reached a climax when all performing artistes (except Teen Top due to their tight scheduling) came out on stage to express their heartfelt appreciation to the audience. 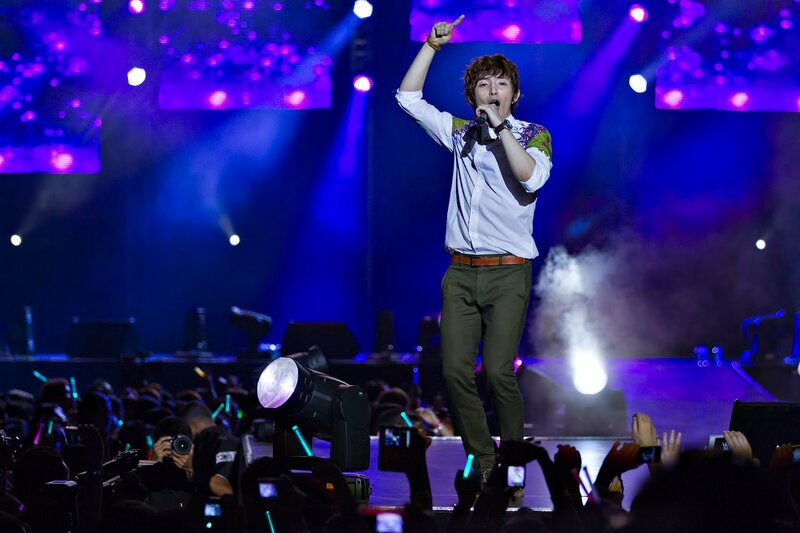 It was certainly a night to remember and behold for all fans who were present at the concert that night. 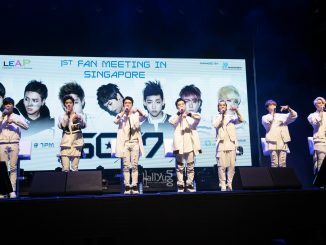 Special thanks to Launch Entertainment for extending the invitation to HallyuSG to cover Boyz Nite Out K-pop Festival in Singapore. 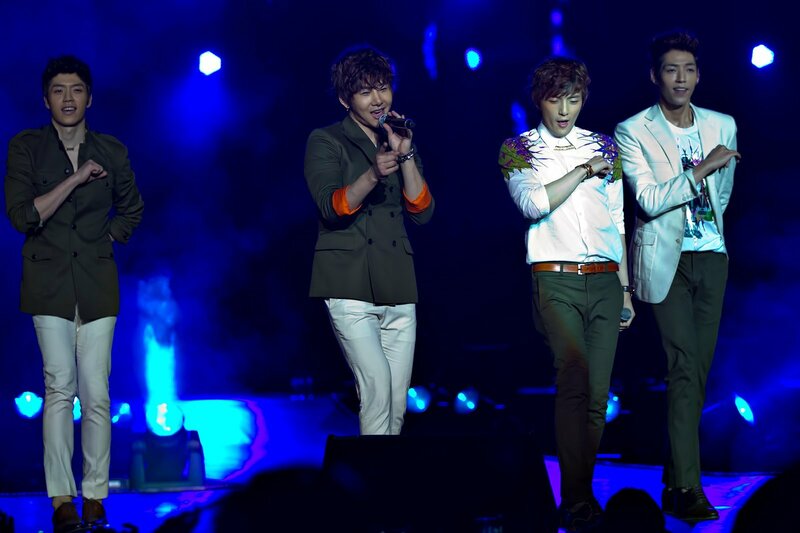 All photos in this post are fully taken with credits from concert organiser, Launch Entertainment. Don’t forget to follow us on twitter and facebook to receive the latest updates and coverages of the upcoming K-pop events in Singapore!